On the night between 26 and 27 of February 1991 a massacre took place on highway 80 in Kuwait. Thousands of Iraqis had been caught in a long convoy while retreating to the Iraqi border. American airplanes had first blasted (mostly civilian) vehicles, which had definitely been stolen from Kuwaitis, in the front and rear of the convoy on the road to Abdaly. The trapped convoy was then bombed relentlessly by wave after wave of attach aircraft, Warthog, and Apache helicopters with cluster bombs, missiles and machine gun fire. That has been called Turkey Shoot afterwards. Rapists, murderers and thugs, sort of people involved in any war, I am afraid. You may see the kind of vehicles on what is now known as Highway of Death, including transport buses and indeed one tank, on the picture above. American film director Sam Mendes had used pictures of the incinerated bodies in burnt-out vehicles which had been encountered, after the act, by clueless and bored, unavailingly trigger-happy American ground soldiers in a drama scene of his moderately apt Jarhead of 2005. 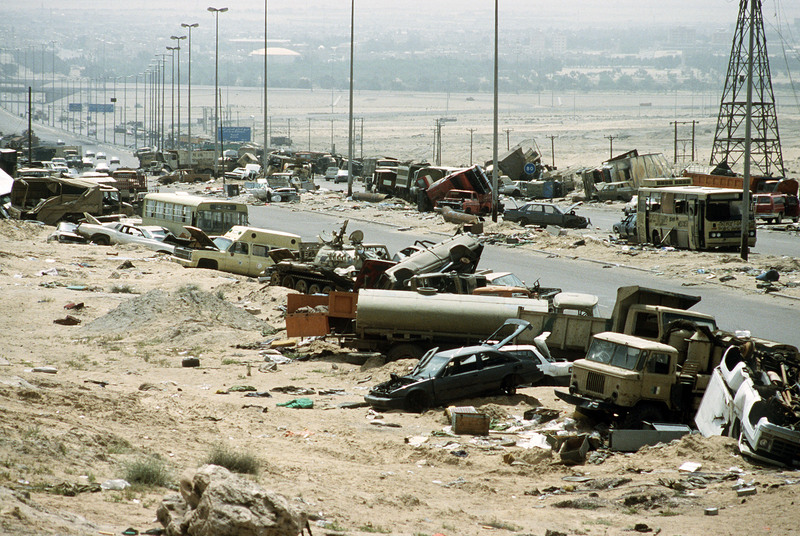 The second Gulf War (after the Iran-Iraq war of the 1980s) then lasted for twenty years. Kuwaitis have cleaned up the site in the meanwhile, and when leaving Kuwait City and driving either north toward Abdaly or east to Bubiyan Island (another American target on that particular night), no conspicuous wreckage would be visible anymore. 28 December 2012 @ 12:18 pm. Last modified December 28, 2012. This entry was posted in Iraq, Kuwait, USA and tagged Highway of Death, Jarhead, Operation Desert Storm, Sam MendesNorman Schwarzkopf, Turkey Shoot, war crime. Bookmark the permalink.